Healthy mountain ecosystems help buffer the impacts of climate change for local communities, wildlife and downstream populations worldwide. Locally, mountain people rely on their surrounding environment for water, food, pasture and the raw materials that are the foundation of their livelihoods. Further downstream, towns and cities depend on mountain water for drinking, agriculture and industry. Efforts to manage, conserve or restore natural environments can help people adapt to climate change by taking advantage of a healthy ecosystem’s natural resilience. For example, programs that enable mountain farmers to sustainably cultivate, harvest and market valuable native crops provide a dependable source of income, promote biodiversity conservation and help maintain healthy soil. Similarly, by carefully managing a mountain watershed, erosion and pollution are reduced and native plant species and wildlife can rebound. This also helps ensure sufficient water supply for local communities and for populations further downstream. These nature-based solutions are examples of Ecosystem-based Adaptation, or EbA. The Ecosystem-based Adaptation approach is widely recognized as an important strategy for adapting to the impacts of climate change. It is cost-effective, yields multiple benefits, and can be implemented by communities themselves. But in mountain areas, on-the-ground EbA measures have not been widely implemented. To help build support for EbA approaches in mountains, both on the ground and in national and international policy, The Mountain Institute (TMI) and the International Union for the Conservation of Nature (IUCN) have joined forces to launch a three-year program working on EbA in key mountain regions. 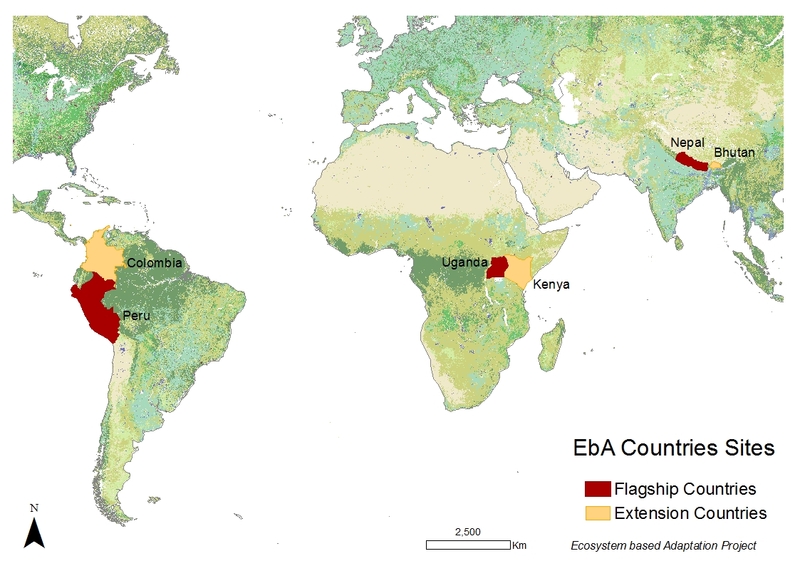 Our goal is to expand EbA work started during the “Mountain EbA Flagship Programme” in the Himalayas (Nepal), Mount Elgon (Uganda) and the Andes(Peru) and to support the EbA approach being adopted in neighboring Bhutan, Kenya and Colombia. Our Mountain EbA Program seeks to benefit local people directly, as well as the millions downstream who depend on the water and other benefits that come from mountains. We will also identify and assist conservation and development projects already underway that could benefit from Mountain EbA practices. The EbA experience and data we develop through this program will be instrumental in building wider support and generating financing for EbA within national governments and at international forums. MORE ABOUT OUR EBA PROJECT IN NEPAL. MORE ABOUT OUR EBA PROJECT IN PERU. The formal title of the program is “Scaling Up Mountain Ecosystem-based Adaptation: Building Evidence, Replicating Success, and Informing Policy.” This program is part of the International Climate Initiative (IKI). The Federal Ministry for the Environment, Nature Conservation, Building and Nuclear Safety (BMUB) supports this initiative on the basis of a decision adopted by the German Bundestag. The Mountain EbA Program is led by The Mountain Institute (TMI) and implemented jointly with the International Union for the Conservation of Nature (IUCN) and country partners over the period 2017-2020.